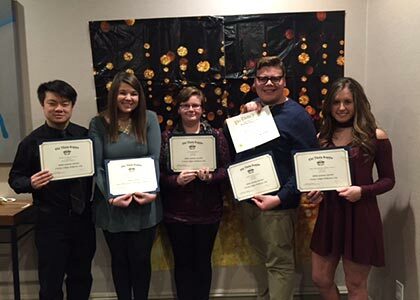 Alpha Gamma Upsilon, Ark City campus's chapter of Phi Theta Kappa, attended the Regional Convention in Wichita, Kansas from Friday, March 3 – 5. 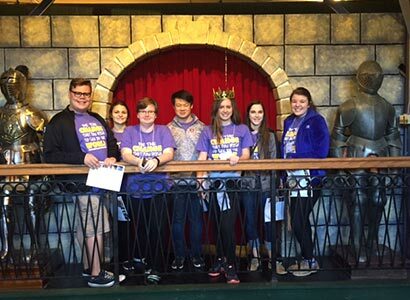 Chapter president, Ashley Huslig; Vice President of Leadership, Abigail Garcia; Vice President of Fellowship, Steven Lu; Vice President of Scholarship, Kyndal Dutton; Vice President of Communication, Deidra Shiever; members, Julien Cornejo and Shayna Templeton; and advisors Deborah and Scott Layton had a full weekend of activities. Friday’s events were sponsored by the University of Kansas, Nebraska Wesleyan University and Nebraska Methodist College. On hand was Sydney Pemberton, the division’s International Vice President and former regional Vice President of the Southern District, who spoke about being the change we wish to see in the world and accepting failure as a way to learn and thrive. Students were treated to ice cream while they viewed the region’s artistic submissions and visited with those running for regional office. Later, Sydney was joined by six former regional officers in an informational panel regarding the impact Phi Theta Kappa membership has had on their lives. Following the general sessions, enjoyed Doug Wilson’s standup comedy routine. Saturday was a full day of fun sponsored by Kansas State University, Southwestern College and Hastings College. Students and advisors attended breakout sessions on the College Project, the five star chapter plan, the alumni association, the competitive edge, membership recruitment and PTK 101. They then toured the Museum of World Treasures as a part of the Honors in Action exploration of the theme: How the world works, global perspectives. The evening’s activities included the awards banquet and ceremony followed by a dance. At the awards ceremony, Alpha Gamma Upsilon was recognized for achieving the Five Star Level, the highest status internationally, again this year and received fourth place for Most Outstanding Chapter, which is based on the chapter’s scores on both the Honors in Action and College Project Hallmark writings. The chapter received an honorable mention for the Honors in Action Award and third place for the College Project Award. AGU also received third place in the Great Idea Award for its Smarties Campaign. In addition, Chapter President, Ashley Huslig, received an Honorable Mention as Distinguished Officer. Officers and members would like to congratulate Jeramy Lamar, Mulvane’s Beta Phi Upsilon member, for being named the new regional president as well. Sunday’s general session, sponsored by Newman University, culminated with Rob Quillen’s moving story about a strangely fateful day that changed his life. His inspiring story has been featured in books and on television programs. Author of Why Wait? Making Other People’s Dreams Come True, Quillen challenged students to make a decision to reach out and help those around them before it is too late.